The British Broadcasting Corporation’s “Ceefax” service. It was the first digital information broadcasting service, launched in 1974. In the 1960s, the BBC experimented with the idea of broadcasting a newspaper to hard-copy printers in homes during the early hours of the morning. It worked by rasterising (converting into lines) text, sending it as a TV image to a special printer that could receive and print it. However, the printer was noisy! Who was going to want that in their house clattering away at 3am? The project (called Beebfax) was shelved in 1970. However, technology was advancing quickly, and the project was soon revived in electronic form. Ceefax broadcast digital text information which was decoded and displayed on television screens using a simple computer system. 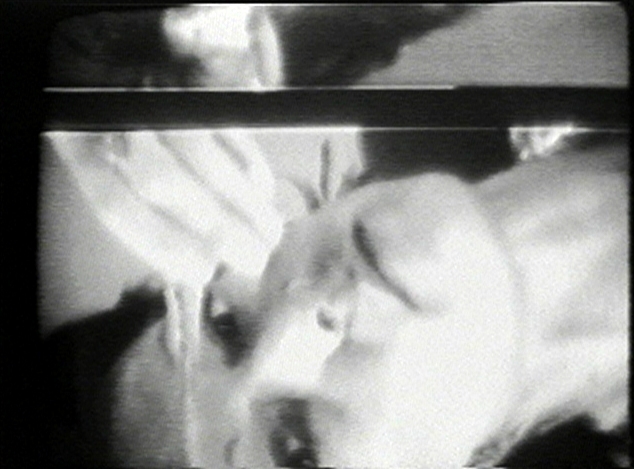 The BBC began test transmissions in 1972 and rolled-out the system in 1974. Ceefax team members encoded pages using computer terminal, which would then be transferred to the video encoder using paper tape. The encoder inserted an invisible signal containing the data into the BBC’s TV channels. 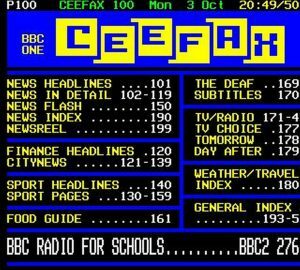 Ceefax was an extremely simplified form of the World Wide Web. Users could navigate a menu-system eventually consisting of hundreds of numbered “pages”. Some pages provided information, and others directories of other pages. Pages could link to other pages by referencing their numbers. Users typed desired page numbers into their remote control, and could navigate the information quite efficiently. The service provided a variety of information typical to newspapers of the day, including news, weather, sport, finance and community updates, as well as articles on science and technology subjects. 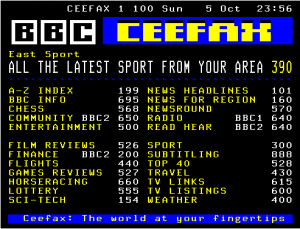 But unlike newspapers, Ceefax’s information was updated in real-time. Often, the first place breaking news could be found was on the service. Ceefax journalists would monitor the various newswires, and then when news broke or was updated, they would use a computer terminal to update the appropriate Ceefax page (of which there were originally only 24). They would then create a punched tape, which would then need to be carried down two flights of stairs to the “Central Apparatus Room” where the Ceefax signal was actually encoded, and fed into the equipment there. Woe betide the journalist who made an error – they would have to do it all over again, and there wasn’t a lift! Engineers working on the original Ceefax project realised that some of those 25 or so empty lines could be used to transmit digital data, by encoding a binary pattern into the signal. 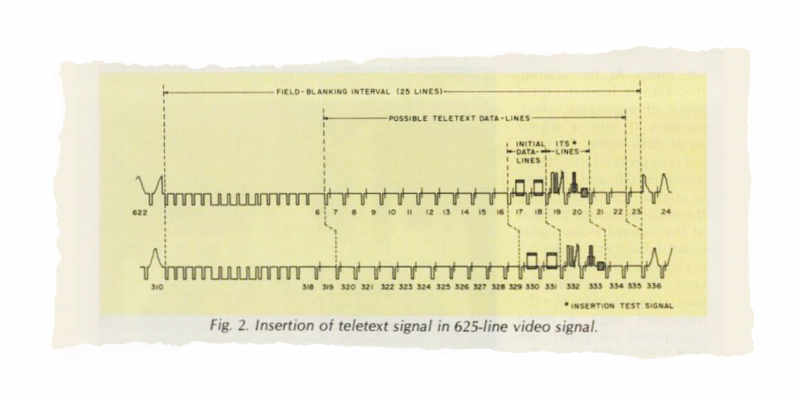 No modification to the existing television standard was required – the Vertical Blanking Interval provided the engineers with a “free lunch”. However, this method obviously couldn’t provide data on demand, it could only stream data passively to a receiver. Also, RAM was expensive, and people couldn’t be expected to leave their Ceefax decoder (or compatible TV) on all the time! So, given all of that, how on Earth did it work? The solution was to repeat the data containing all of the available pages over and over again, broken up into pieces and spread out across hundreds of vertical blanking intervals. 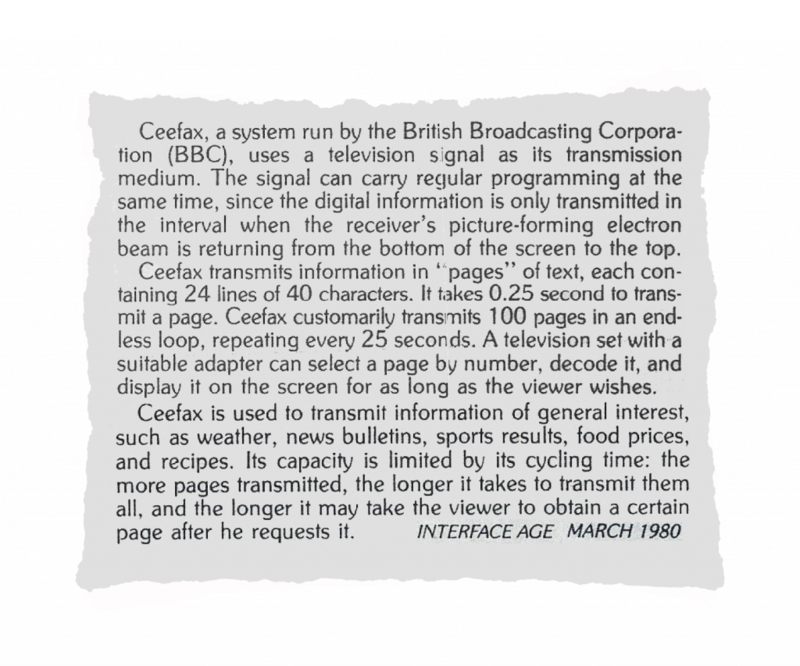 Each page contained an identifying header, and when a user requested one, the decoder would simply wait until that header appeared, and then copy the data subsequently decoded into the Ceefax receiver’s video memory. It didn’t need any additional memory, and this helped to keep the cost of receivers reasonable for the time. Commonly accessed pages could be repeated more frequently than less-commonly accessed ones, which could mean sizeable delays (of up to 15 seconds) for low-demand pages, but most Ceefax users didn’t seem to mind – it was still faster than going to the newsagent. Interestingly, the original Ceefax project was intended to find ways of providing information those with visual disabilities, and its method of encoding information into the VBI would eventuate in accomplishing precisely that, in the guise of closed captioning. 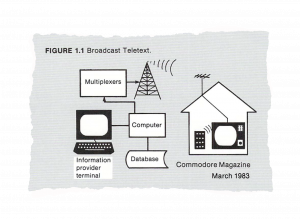 In fact, in North America, it is the only form of “teletext” that ever gained widespread adoption – while Ceefax would lead the way for other teletext services, including fellow UK competitor, ITV’s Oracle, the Antiope system in France, and Austext in Australia, commercial US networks couldn’t justify the cost of implementation when American consumers weren’t interested in it enough to pay for the additional cost of teletext receivers, or additional circuitry in television sets. With the rise of the Internet and the end of analogue broadcasting, the Ceefax service came to a close in 2012, after 38 years.